There are a variety of ways to save on your insurance. There are many discounts available to our customers, offered by the many insurance carriers that we represent. Carriage Insurance has provided a list of the most common insurance discounts available for our clients. Remember to include information that will help us get you the discounts you deserve! Get a discount when you insure more than one private passenger auto on your auto policy. Be a safe driver with a clean driving record and drive a safe car. Customers who drive less, pay less. If you add a home, condo or renters policy, you can qualify for a discount on your auto policy. 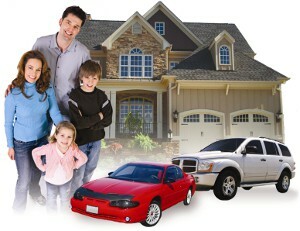 Customers who own a home qualify for a discount on their auto policy. Pay for your policy in full and you can qualify for a full-pay discount. If you buy comprehensive coverage on autos with qualifying anti-theft devices, you can qualify for an anti-theft discount. Install anti-theft devices like car alarms, GPS tracking devices, window etching, ignition shut-off devices and steering wheel bars. If your car has a Lo-Jack® or Teletrac® system you may even have your comprehensive deductible waived if your car is stolen while the service is activated. You can get a discount for having a car equipped with a factory installed 4 wheel anti-lock braking system. Save money if your car has automatic air bags. Youthful drivers that accomplish certain scholastic achievements and who provide certification, can qualify for a good student discount on their auto policy. If you have a youthful driver in the household who is away at an educational institution over 100 miles away from home, and who does not have a car, you can qualify for a distant student driver discount on your auto policy. Youthful drivers who have completed a driver education course can qualify for a driver training discount on their auto policy. Get a discount when you compete an approved defensive driving course and can provide a copy of your certificate. While this may not be a “discount”, rates will be lower for married couples. The better your credit score, the lower your car insurance premiums will be. Some carriers provide a discount for AAA membership. Customers who have an auto policy with the same company can oftentimes qualify for a discount on their homeowners policy. Homes built less than 10 years ago can qualify for a newer home discount on the homeowners policy. This does not apply to condo or renters policies. If you install an approved and properly maintained burglar alarm system you could qualify for a burglar alarm discount on your homeowners policy. If you install and maintain a fire sprinkler system in accordance with nationally accepted fire sprinkler standards you could qualify for a sprinkler system discount on your homeowners policy. Customers who successfully complete an approved motorcycle safety course qualify for a discount. If you insure more than one motorcycle or off-road vehicle (ATV, Snowmobile or Golf Cart for example) you can qualify for a discount on your motorcycle policy. If you have a membership in any of a number of identified riding associations, you can qualify for a discount on your motorcycle policy. If you own a single family residence, townhouse, condo or mobile home owned and resided in by the named insured, you can qualify for a discount on your motorcycle policy. If you have comprehensive coverage and lock your motorcycle of off-road vehicle in a secured structure overnight you can qualify for a discount on your motorcycle policy. If you are a new customer and have had continuous coverage over the previous 12 months, you may qualify for a discount on your new motorcycle policy. If you have comprehensive coverage and your vehicle is equipped with a device that uses a radio frequency network in conjunction with a participating police agency to locate the vehicle you may qualify for a discount on your motorcycle policy. If your vehicle is equipped with a factory installed anti-lock braking system (ABS) you may qualify for a discount on your motorcycle policy. If you have one or more years of motorcycle, snowmobile or ATV riding experience, you may qualify for a discount on your motorcycle policy. If you have owned 1 or more insured motorcycle or off-road vehicle for 2 or more years, you may qualify for a discount on your motorcycle policy. If you have an auto, home, condo, renters, or motorcycle policy also insured, you may qualify for a discount on your watercraft policy. Customers who have completed a coast guard auxiliary course or state boating safety course, you may qualify for a discount on your watercraft policy. If you have 2 or more watercraft, you may qualify for a multi-watercraft discount. If you have 5 or more years of boating experience, you can qualify for a discount. You may receive a discount when you store your boat or personal watercraft out of water for at least three months per year. You may receive a discount when your boat has features like Automatic Fire Extinguishing Equipment, Monitoring Systems, Alarm System, No Strike Lightning System, Theft Recovery System, Dock Assist, NMMA Certification or a PWC Brake System. The more features it has, the bigger the discount! You may receive a discount after 3 consecutive years without a loss. You may receive a discount when you are 55 years or older. If you have a watercraft powered by diesel engines you can qualify for a discount on your watercraft policy. Outboard boats and personal watercraft are not eligible. If you are a homeowner you can qualify for a discount on your watercraft policy. Customers who have their auto and motor home written on the same policy may qualify for a private passenger auto discount. If you also have a homeowners (home, condo, or renters) policy, you may qualify for a discount on your Landlord Protection Policy.